Defense lawyers for Robert Kraft, the owner of the New England Patriots who has been accused of soliciting a prostitute in Florida, have filed a motion to exclude an important piece of evidence in the prosecutor's case: Video surveillance that allegedly shows Mr. Kraft in the massage parlor. At issue: Whether police infringed on Mr. Kraft's Fourth Amendment rights that prohibit unreasonable searches by law enforcement. Most people are aware that Robert Kraft, billionaire and owner of a professional football team, was charged with solicitation for allegedly paying for sexual favors in a massage parlor in Florida. Many of those people have heard that there is a video of Mr. Kraft committing the crime of solicitation – in Pennsylvania, the offense of “patronizing prostitutes” that is prohibited by 18 Pa.C.S.A. § 5902. Fewer people, though, are aware of how the police obtained that footage. The police in the case used a “sneak-and-peek” search warrant, though they are officially called delayed notice warrants. Police obtain these warrants in the usual way – by getting a judge or magistrate to sign off on the warrant application – but when they execute a sneak-and-peek warrant, the whole point is that the suspect never knows about them until well afterwards. Instead of knocking on a suspect's door, announcing the search warrant, and then barging in and executing it, police perform a sneak-and-peek warrant without the suspect being warned or even notified. In many cases, police break and enter a suspect's house or car – a crime, if someone else does it – in order to search the premises. Many sneak-and-peek warrants are done specifically to try to obtain evidence of a crime that police need but do not have. Essentially, sneak-and-peek warrants allow them to do the search necessary to find the evidence that they would need to justify the search, in the first place. In Mr. Kraft's case, it appears that police in Florida executed a sneak-and-peek search warrant on a number of massage parlors that they suspected of human trafficking: Officers posed as repairmen and planted cameras in several of the massage rooms to record what happened inside. Now, Mr. Kraft's defense lawyers are claiming that the methods used were way too invasive for the offense charged – solicitation in Florida is a misdemeanor, but the sneak-and-peek warrant used is usually reserved for felony offenses. Of course, the sneak-and-peek warrant was being executed on the massage parlor to look for a serious offense of human trafficking, not on Mr. Kraft for solicitation, so it remains to be seen whether Mr. Kraft's attorneys will be successful in excluding the video evidence. Filing a motion to suppress is a common part of a criminal defense strategy, no matter how serious the offense. When police violate your Fourth Amendment rights during their investigation, the evidence that they obtain is supposed to be excluded from court. However, it often takes the advocacy of a criminal defense attorney like Joseph D. Lento to make sure that is what happens. Contact him online or call his Philadelphia law office at (215) 535-5353 if you have been charged with a crime. "I pride myself on having heart and driving hard to get results!" 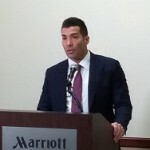 Joseph D. Lento has more than a decade of experience fighting for the futures of his clients in criminal courtrooms in Philadelphia, the Pennsylvania counties, and New Jersey while concurrently representing students in disciplinary proceedings at universities and colleges locally and and nationwide. He does not settle for the easiest outcome, and instead prioritizes his clients' needs and well-being.